Gao Zhisheng during an interview at his of fice in Beijing, in a file photo. Top Chinese rights lawyer Gao Zhisheng remains effectively under house arrest, 10 months after his release from prison on subversion charges, his family said on Wednesday. Gao, 52, is currently under 24-hour surveillance by state security police at the home of his wife’s parents in the northwestern region of Xinjiang, where he was released from a three-year jail term for “incitement to subvert state power” in August. While he is allowed to maintain phone contact with his family in Shaanxi province, Gao remains in Xinjiang, his brother Gao Zhiyu told RFA on Thursday. “I talked to him recently and he is better now—[his physical condition] has been good for the past several weeks,” Gao Zhiyu said. According to Gao’s friends, such as Beijing-based rights activist Hu Jia, the rights lawyer had barely been able to speak an entire sentence when he was first released from Xinjiang’s Shaya Prison, where he had been held for lengthy periods in solitary confinement and tortured. Gao suffered psychological torture and various forms of corporal punishment, severely affecting his memory, and leaving his teeth in such bad shape that he was unable to chew, they said. Gao Zhiyu said his brother was mostly reading at home these days, while he remained under surveillance by authorities. He said he was unsure how many people were monitoring Gao at any given time. Gao’s wife Geng He fled China with the couple’s two children after her husband “disappeared” for more than a year, arriving in the United States with the couple’s two children in 2009. During the Chinese New Year in February, Geng told RFA that she had tried to contact Gao, but was unsuccessful. 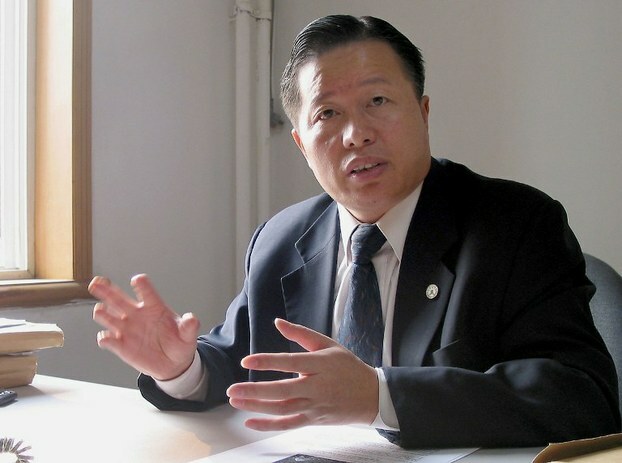 This entry was posted in Headlines, Human Rights Lawyer, Writers in Prison and tagged Gao Zhisheng, Human Rights Lawyer. Bookmark the permalink.